What’s the difference between yours and your’s? 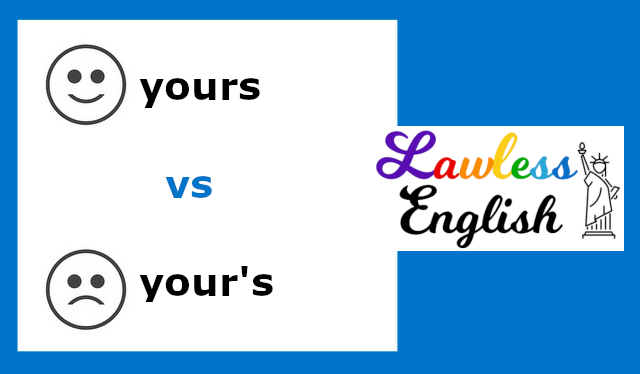 Yours is the second person possessive pronoun – it replaces "your" + noun. Is this yours or theirs? He found a book – is it yours? I can’t find my wallet, but yours is on the table. Yours is a better idea. Though you may see your’s written even by native speakers, it is incorrect. Yours should never have an apostrophe. 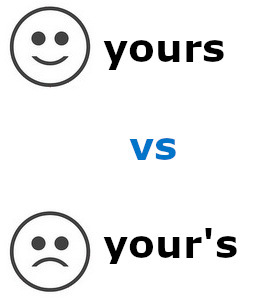 The idea that yours needs an apostrophe comes out of the fact that on virtually every other word, ‘s indicates possession, so English speakers sometimes think yours should be spelled your’s. However, this is always incorrect – yours is the only correct spelling.